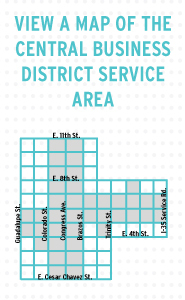 Every night, Austin Resource Recovery sweeps and cleans designated streets and alleys in the Downtown Recycling and Trash Service District, and trash is collected from receptacles along Sixth Street and Congress Avenue. Learn more about how Austin Resource Recovery keeps Austin clean. Austin Resource Recovery also manages a commercial trash and recycling Dumpster contract, required by Austin City Council Ordinance 20051020-063 for businesses located in the Downtown Austin Recycling and Trash Service District. Base rate: Visit the Commercial Collection Services page for current rate. Clean Community Fee (all businesses pay this fee): Visit the Commercial Collection Services page for current rate. Base rate: Visit the Residential Rates & Fees page for current rate. Clean Community Fee (all residential customers pay this fee): Visit the Residential Rates & Fees page for current rate. There is no additional fee for recycling service.